This post has been viewed 3933 times. Difficulty Reading? Click Here http://hethathasanear.com then on the article to change to larger type. The words "I AM" do not appear in the Hebrew language. This is an English translation of the Greek approximation taken from the Hebrew consonants YHVH appearing in the Torah (the Hebrew language contains no vowels. A vowel-like inflection is given to an individual letter by means of the "jots" and the "tittles" that appear directly above and below the letter when written). These consonants (phonetically pronounced YAH-HO-VEH) are literally read in Hebrew as "the Present Presence". Since Jewish Rabbinical tradition considers His Name too sacred to speak (which is actually a subversion of His command to "proclaim" His Name), that tradition simply refers to Him as "the Name", hence, Baruch haShem in Hebrew means "bless the Name". The Name they are speaking of is YHVH. 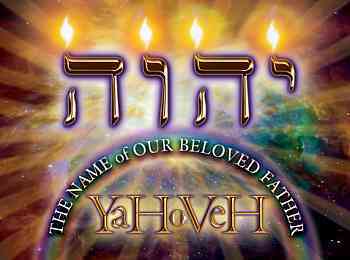 YHVH is made up of the consonants yod, hey, vav, hey which lend themselves to the reading of Yah-Ho-Veh, and means Yah is the Present Presence - just as hoveh, is derived from the verb "to be" which means being in the present or continuous, as well as "the present". Thus, He is the One Present who is constantly "being", hence the "Present Presence". But (as if this is not enough), Yah is another derivation of the verb "to be" but missing the first consonant. In Hebrew, a verb is the part that indicates time. In the case of the verb "to be" it would be: past - ha'yah, present (as we have seen) - ho'veh (v and y are interchangeable in Hebrew), and future - ehe'yeh. Thus, the yod, hey-yah, speak of He Who Is outside of time. Here we also have a double witness (which scripture requires - Numbers 35:30, Genesis 2:7 click on highlighted verse to see scripture) in both Yah and Hoveh, of His Eternal Being. Additionally, verbs in Hebrew don't stand alone. For every verb there is usually one or more compatible "brother verbs" sounding similar with augmented meanings and sometimes opposite in meaning (such relationship can be seen for example in k.v.r. - to bury and k.f.r. - to cover). In this case, h.v.h. (to be) may be coupled with ch.v.h. (ch as in the Scottish loch) which is the root for "to live". So altogether, YHVH may be understood as "The Eternal One Who is the Living Present Presence" - or something like that. Courtesy of Rimona Frank, Hebrew linguistic scholar, Israel. The Greek language is linear in conceptualization, meaning the thought process travels a straight line logic; whereas Hebrew is more "picture-esque", if you will allow that expression (see My Big Fat Greek Mindset, Part 1 and Part 2, for an intelligent read of what this logic is, where it comes from and how it has become infused into our way of approaching scripture. This is key to understanding what follows.). This is why it benefits us to view scripture from the Hebrew mindset these authors wrote from and very different from a Greek approach. In John 17:3-12, Yeshua said this is eternal life, to KNOW the Father in this Present Presence. Since Life is only found in the Presence of the Father, Eternal Life means to know how to remain, to BE, in His Presence constantly. This Knowing of the Father's Essence is what He was indicating in His prayer that He had kept the disciples in His Name, more appropriately translated from the Hebrew that He kept them in "the Present Presence" of Who the Essence of the Father IS by manifesting, living out before them what that Name meant - what it meant to constantly dwell in the Present Presence of what that Essence is (see what it means to BE In His Name). How did He manifest the Present Presence? Again, In John 8 above, He equated His KNOWING the Father to two things - denying Himself (not honoring or glorifying Himself) and keeping the Father's words. 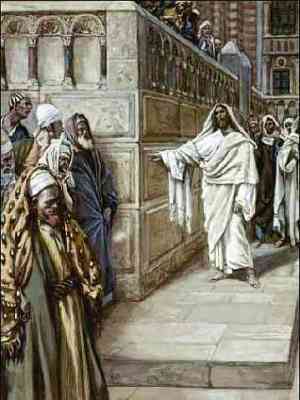 What "words" was Yeshua referring to? Part of the Father's Glory shown to Moshe (Moses) in Exodus 34:1-7 begins with the first verse. The words were the Ten Commandments - not the Nine Commandments or a variation of what we think those commandments should say (see the Glory and the Testimony). Yeshua said they did not KNOW the Father in this intimate manner even though they said with their lips He was their God (yow-wee! could that be us?) - but, yet, these were Jews who kept the commandments. How can it be they could keep the commandments and still miss knowing God? Knowing the Father takes both the denial of our self AND the keeping of the Father's Words. The world is adept in the nobility of pouring out of their selves, their resources, as we have recently seen in the aftermath of the tragedy in Haiti - but lacking the coupling of the moral compass of Who the Essence of the Father Is, consequently, elevates and honors the goodness of man instead of the Father. The Jews became religiously adept at keeping the letter of the law - but, kept from their own efforts lacked the clarity of Virtue found in the Father's Essence, and consequently, resulted in SELF-righteousness which is, again, the elevation of men. So, does this mean that because some mishandle and misappropriate the words of the Father we have license to completely ignore them? Yeshua was saying, that because He elevated the Father, if we kept HIS Words (which are the words of the Father's) in the same manner HE did (by denying Himself the luxury of self-interpretation of those words), we would find ourselves absorbed in same Virtue, the same Life of the Father that He exhibited. Access to that Life first requires a denial of this life (Mark 8:34, see the Law of 100%). So, in the verses at the top of the article, when Yeshua was proclaiming to be before Avraham was, He was stating He was literally Present in the Presence of the Father, referring to this verse in Exodus 34:1-7. He was saying that by keeping these words, the commandments of the Father, and by not honoring or glorifying Himself, He was afforded a portal to constantly abide in the Present Presence that was before Avraham and if they would, likewise, keep those same words, the commandments of the Father, in the same manner He exhibited (this is important), they also could dwell in the Present Presence. Yeshua said Avraham dwelled in that Presence and (since there is no time in eternity to separate them) was able to rejoice in seeing Yeshua. How did Avraham dwell in the Present Presence? In Genesis 26:5 the Father says it was because he did not withhold anything from Him and "obeyed My voice and kept My charge, My commandments, My statutes, and My laws." Avraham's behavior was conformed to the core Essence of Who he found his Friend to be. In that core was the selflessness of obeying His Voice and keeping His Commandments. In like manner, Yeshua said IF (big little word) we would remain in His Presence, our spirits would never die, for it is in the Presence of the Father we find Life. Our salvation is in finding Life and then to remain in the Present Presence of that Life constantly. The Greek word for eternal is aionios and means without beginning and without end. Eternity is right NOW. It always has been and always will be. If we embrace His Essence, personified in His Words, eternity is in our hearts (Ecclesiastes 3:11, Luke 17:20-21, Romans 14:17). There is no time in eternity - it is a constant present. This is why Yeshua could say that before Avraham was, He was in the Present Presence. He kept His Father's Words because He KNEW those Words contained the Essence of His Presence. 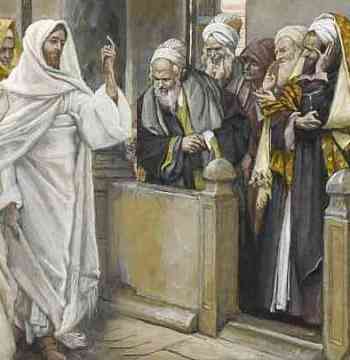 Our behavior, as with Yeshua's, is the determinant of coming into His Presence. Conforming our behavior to keeping His Words, His Commandments, aligns our spirit to the Essence of His Spirit, thereby granting us opportunity to abide in, dwell in, live in the Presence of the Father and to learn of Who He Is (see the Law of Grace). Of the four times in the gospels when Yeshua is specifically asked how to obtain eternal Life, each time He responds with the same answer - to keep the commandments found in the Tenakh, the Original Testament. He even repeats them to be sure there was no mistaking what words He was referring to (Matthew 19:16-22, Mark 10:17-21, Luke 10:25-28, Luke 18:18-22). To obtain eternal life is to become joined with the Father in His Constant Presence and, by so doing, to share in His Life (see Salvation and Eternal Life). Salvation is not a verbalization of formulistic phrasing. Salvation is a life lived in the Present Presence which is Life. Most will respond by saying that "salvation is though Christ, not observing the Law. Christ fulfills the Law. I depend on His righteousness for salvation." Now, as religious as that sounds, according to the words of Yeshua in the passage above, the Way we come into that Presence, the Way we obtain that righteousness is to conform our behavior to the Essence of His Presence. That Essence is described in Exodus 34 and it begins with the very first verse. That is what Yeshua said He did and what He said we could do IF we also keep the words of the Father. THAT is the salvation found through Christ. THAT is the righteousness of Christ - doing it HIS Way. Not ignoring His Way because of the lie of man's traditions (see the Righteousness of the Law). Everyone is looking for the end times when Yeshua will appear when all along YVHV and Yeshua are right here among us right now IF (there's that word again) we will only submit ourselves to Who HE says He Is - not Who we want Him to be. Words mean things. Read these words just for what they say - not by what we have been taught to think what they say. 2Timothy 2:19 says to let everyone who names the Name of the Lord depart from iniquity. Matthew 24:12 says that because iniquity abounds, the love of many will grow cold. The Greek word translated iniquity here is anomia and means "the condition of without law". The spirit of antichrist is already among us today - it is the spirit of lawLESSness (1John 2:18-23). or for information if you feel led to contribute to this ministry. Click here to watch the short movie Maranatha!.